Water service providers are facing new challenges in forecasting and preparing for future water demand, staying fiscally solvent while providing fair prices, incorporating conservation and efficiency, and communicating clearly to customers about rates and service. Beginning in 2012, the Pacific Institute conducted an extensive survey and series of workshops on water rates and finances to better understand how water is priced by more than a thousand different water providers in California, both public and private – and to help agencies identify effective rate-making strategies. The resulting Need To Know: Water Rates series (see below), released in partnership with the Alliance for Water Efficiency and the Community Water Center, highlights strategies that help water service providers cope with the “new normal” or an era of decreased water demand due to a variety of factors from weather to the economy to increased conservation and efficiency. In the spring of 2013, the first white paper on the Institute’s Water Rates Survey and research was also released. This new research analyzes different rate structures that can be used to accommodate this “new normal” so that a utility is able to meet costs and ensure resiliency in an uncertain future. The most common water rate structures – flat fees, uniform rates, block rates, and water budget rates – require varying levels of financial, institutional, and human capacity to implement, and so choosing between them means evaluating whether the potential benefits are greater than the cost to provide the necessary capacity. 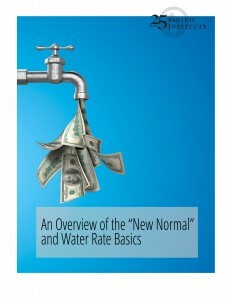 The white paper An Overview of the “New Normal” and Water Rate Basics examines the rate structures and the characteristics of the new normal, which includes more uncertain water supply; new legislation, codes, and standards; and overall increasing costs to provide a safe drinking water supply. New legislation in California has also directly affected the water rate-setting process by requiring new processes for changing water rates, and has indirectly affected the water rate-setting process by requiring water conservation, which impacts total water sales – and therefore revenue. These “Need To Know: Water Rates” series briefs include pointed information and strategies to help water managers plan water rates for conservation pricing and affordability – and to communicate with their customers for best results. To help rate-payers understand how their water is priced, and to help water managers who are involved in the planning and communication of water rate structures, the Pacific Institute white paper also provides case studies that highlight some of the challenges associated with adopting new rate structures. These include Carmichael Water District’s change from a flat fee to a volumetric rate structure; the Moulton Niguel Water District’s move to a water budget-based rate structure; and the City of Pasadena’s move to a three-tiered water rate structure. The white paper, An Overview of the “New Normal” and Water Rate Basics is the first in a series covering critical issues for water service providers as they deal with the “new normal,” including: water affordability, water financing mechanisms, and lessons from the energy sector. These additional white papers will be released over the coming month. Read about our Water Rates Survey 2012.